BPBO produced it’s “10 Year Report of Migration Monitoring at the Cabot Head Research Station” in the spring of 2012. This publication marks the landmark 10 years of data collection at the CHRS, and offers analysis and interpretation of these data. 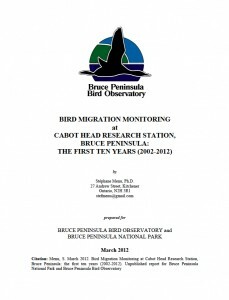 The 10 years of data gathering also means that BPBO is now contributing to the development of long term wild bird population trends by the Canadian Migration Monitoring Network, of which BPBO is a full member. The entire 185 page document comprises 6.5 MB, and is available by (clicking here).